It was something to do instead of the work that I have to complete today. 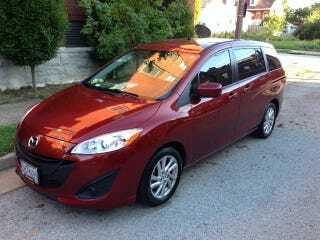 For your viewing pleasure, I present the rare 2012 Mazda5 Sport 6MT in Copper Red Mica, one year only for this color on this bodystyle. Ignore the Homer Simpson doll on the dash - I can't remember why it's there, but it's become a bit of a fixture now and it would seem wrong to remove it. If you look closely you can see the Oppo sticker on the right side of the window (the one on the left is a C&D 'Save the Manuals' sticker). The Oppo sticker freaks me out sometimes when I see it in the mirror as it is a reverse of a reverse image.